Hurricane Matthew, a category 4 hurricane, hit Haiti, the Bahamas and the United States early in October. Operation USA is working with on-the-ground partners to provide relief and recovery aid. Hurricane Matthew hit Haiti and the Bahamas in early October, causing flooding and widespread structural damages. In Haiti, a reported 900 people were killed, while tens of thousands of people lost their homes. UN representatives have stated that as many as one million people are currently in need of relief aid. Damage caused by the hurricane further exacerbates the conditions in Haiti, where communities have been vulnerable since the 2010 earthquake and a subsequent cholera outbreak. Relief workers now fear that the storm’s impact will result in major setbacks to health and recovery progress being made in the country. Several people have died as a result of cholera in the wake of flooding caused by the storm, heightening concerns for another outbreak of the disease. Operation USA has worked in Haiti since 2008. In Jacmel, where conditions are still weakened since the 2010 earthquake, we continue to support Ecole Nationale JM Henriquez, a school rebuilt in partnership with Honeywell as part of earthquake recovery efforts. There, students, staff and partners face new damage and devastation due to the hurricane. On Friday, October 7th, Operation USA’s Haiti Country Director arrived in the country to meet with local partners and assess the devastation in Jacmel and surrounding area. 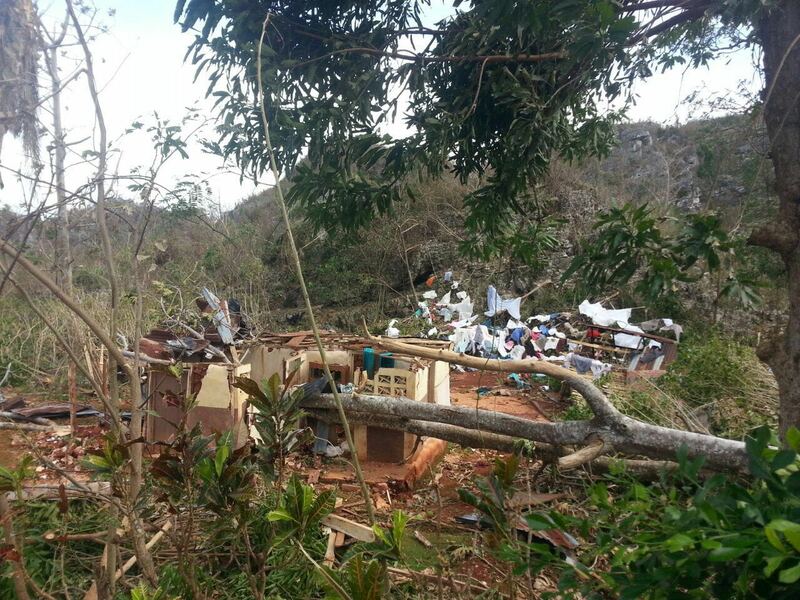 Photos captured in Belanse and Bainet, on Haiti’s southwestern coast, show major destruction. In addition to structural damage, the country’s crops have also suffered extensively–worsening an already persistent food crisis, as an estimated 3.6 million people (one third of the country’s population) were struggling to maintain access to food before the storm hit. That number is certain to increase as a result of storm damage. Access to clean drinking is also limited. Haiti is now in enormous need of support from foreign aid agencies and the public. Operation USA is continuing to seek funds as well as bulk donations of in-kind materials for delivery to affected communities, and will continue to work with partners to deliver aid where it’s needed most as long as funds and opportunities allow. OpUSA will maintain close contact with the community of Jacmel and partners in all areas affected by Hurricane Matthew in order to expedite the recovery process once the full extent of damage is known. Too often, overlooked and under-served communities are completely devastated by major disasters and the long and challenging recovery period that follows. Operation USA prides itself on supporting health and education programs to help children and families in these areas recover, build resiliency and thrive. We maintain low overhead and direct funds where they are needed most, ensuring that your donation has a maximum impact. Operation USA’s Haiti country director, Steeve Texas, and his team have been working tirelessly in the weeks since the storm to bring relief to some of the hardest hit areas of Pestel, Cayemite and Nippes. There, thanks to generous funding from The Ocean Reef Foundation, and the successful procurement of supplies by Steeve and his team, we will distribute kits containing food, water purification supplies and hygiene items to families impacted by the storm. We are so grateful to our partners, donors and supporters who have helped make this vital relief and recovery work happen, and would like to offer special thanks to Steeve and his team for their unwavering commitment to delivering this aid where it is needed most. Operation USA is now aiming to provide further relief and recovery supplies to additional partners in Jacmel and other areas. See photos from the distribution here. 100% of donations restricted to this cause will be allocated directly to relief and recovery from Hurricane Matthew. United MileagePlus members can earn miles for donations until October 21st. Donate via United and OpUSA’s Crowdrise fundraiser and enter your MileagePlus ID at checkout to receive up to 1,000 bonus miles.